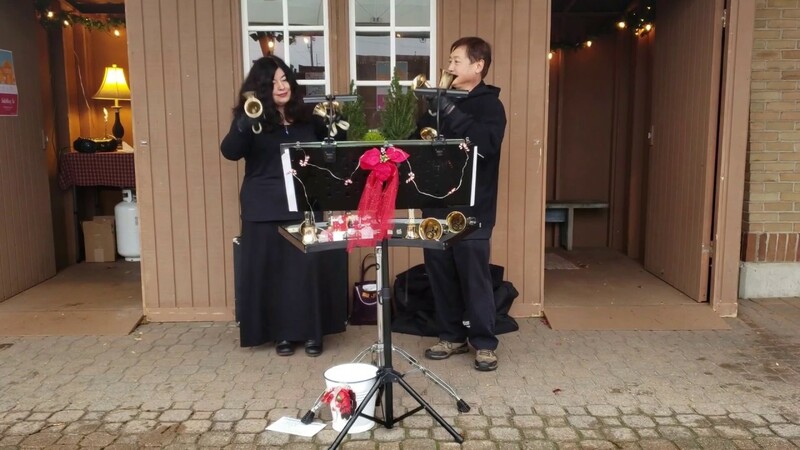 Larry and Carla - Holiday Handbells! In rehearsal - "Chloe's Passion"
Larry is a bass handbell specialist! West Michigan's smallest handbell choir! As West Michigan's smallest handbell choir (yes, it's just the two of us), we provide beautiful handbell music for a variety of events. We moved to Holland (from California) in 2016, and we perform nationally and internationally. Holding two bells in each hand, we specialise in eight-bell duets for many occasions: weddings, Christmas and holiday events, memorial and remembrance services, corporate events, parties, church services and concerts. We can also teach handbell techniques to individuals and groups. Originally from California and England, we're a married couple - brought together by our shared passion for our instrument. Book us now to bring the magic of handbells to your event! Our HASP (Hope Academy of Senior Professionals) Program committee members knew Carla and Larry Sue were gifted hand bell players. What we didn't realize until yesterday's program was that they were entertaining, captivating -- and funny. The entire audience was engaged before the first song had ended and remained so throughout. In a town full of professional and semi-professional musicians, the thunderous applause was, indeed, high praise. Thank you so much, Joyce! We very much enjoyed the HASP event, and appreciated the enthusiasm shown by the audience. It was fun to have the opportunity to answer some interesting and well-thought-out questions from audience members after our program! They play beautifully! Even their movements while playing are very graceful. I loved the information they provided us inbetween the pieces they played. Also loved the variety. Could have listened to them a lot longer--didn't want the program to end. Heard a lot of good comments from others. They sat at my table during the dinner we had prior to the program, and they were very friendly--fun to talk with. Would recommend them to anyone. Thank you, Sue. We very much enjoyed being part of your wonderful Christmas event! So glad to have found this wonderful duo right in our back yard! Such nice people and YouTube doesn't do justice to their amazing talent. Thank you for your kind review. We appreciated your hospitality, and the warm welcome we received on Saturday. We very much enjoyed sharing our music at the Fall Fest celebration, and hope to have the opportunity to visit your church again! Great program for all ages! Larry and Carla put on a wonderful bell Christmas performance. So amazing that 2 people can do so much. Very engaging and interactive. Ages 5-100 enjoyed the show. Thanks!!! The process was extremely quick and easy. Booked Larry and Carla within 36 hours of our event after complications with our previously scheduled entertainment. Thanks for inviting us to be part of your event, Jeanne. We're glad you found GigSalad so easy to use, and happy that we could help out at short notice. Have a wonderful Christmas! This is the second Christmas season Larry and Carla have played at our church. They are so great to work with! Always punctual and far exceed our expectations!! Our congregation loves the bells as they set the mood for our services. We're planning to use them again next year!! Thank you. It was a blessing to be part of your Christmas Eve services, and we look forward to seeing you all again next year! lively conversation over a meal, Larry and Carla presented a lovely selection of Christian Christmas carols . Larry introduced each carol, giving its historical significance, and when appropriate , he explained the logistics involved in playing the music with two players using four bells each to carry the melody and embellish it to sound like a full-orbed bell choir. Larry and Carla's technique was flawless and the tone of each piece was mellow, clear, sweet, and distinct. At the end, Larry invited questions and received a number of them which he answered very clearly. All told, it was the finest handbell performance we have heard and we heartily recommend them to any group desiring truly beautiful and quality entertainment! Thank you so much for your kind words. We very much enjoyed the opportunity to bring our music to your event at this special time of year. We appreciated your group's warmth and hospitality, and we wish you all a wonderful Christmas, and blessings for the year ahead. Thank you. We loved performing at this very special Christmas event, and appreciated the warm welcome we received! Fabulous performance by Larry and Carla! This was a luncheon for 60+ members of the Sally Bender Guild supporting Spectrum Butterworth Hospital Foundation. Larry and Carla were friendly, outgoing and everyone in attendance enjoyed their performance with several saying afterward "this is the best we have ever had at our luncheons", "I was sure I was going to be bored with handbells and am now a true fan". We all enjoyed their comments and brief stories between selections. Thanks again to Larry and Carla for making our Christmas luncheon celebration most special. Thank you so much for your kind review. Your hospitality was wonderful, the event was so much fun, and we appreciated the warm welcome we received from the guild members. We wish you all a very Merry Christmas! We had the pleasure of having Larry and Carla perform at our university relaxation program, and it was wonderful! They were great to work with - professional, promptly responded to email, and tailored the performance for the needs of our program. They had no trouble filling the hour with a variety of music and we were all impressed by their skill and talent - would highly recommend! Thank you! We appreciated the opportunity to be part of the university's relaxation program, and hope to return someday! Larry and Carla performed at our Holiday Party for the first hour. All guests complimented how nice it was to arrive to the sound of hand bells. They did a great job and are wonderful to work with! Thank you. It was wonderful to work with you, and we very much enjoyed being able to add our small contribution to what was obviously a well-organized and very festive holiday party! Thank you, Jackie. We very much enjoyed working with the handbell choir today, and appreciated the warm welcome and hospitality we received from the group. We look forward to seeing you all again in the not-too-distant future! 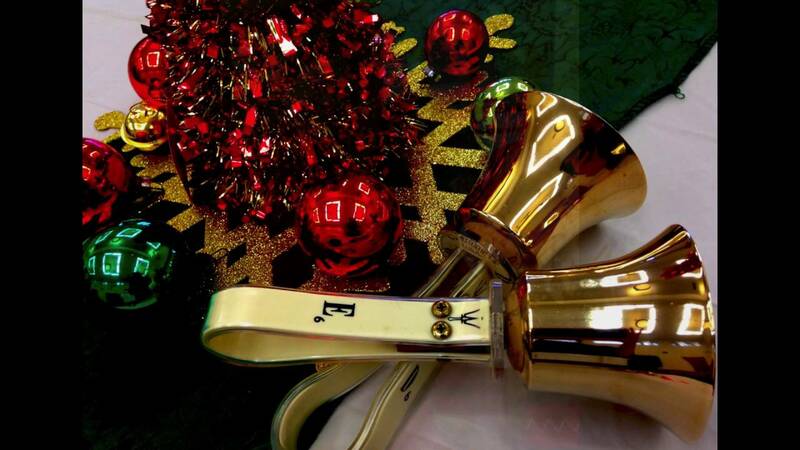 We specialize in performing handbell music specially arranged (by us) for just eight handbells. We hold two bells in each hand, and our performance will demonstrate that handbells are not just beautiful to hear, but a visual art as well. If you book us for your event, we'll bring our own handbells, music, table and music stand, and will require much less floor space than a "regular" handbell choir. We can perform in a space as small as 8 feet x 7 feet, which makes us very suitable for venues where space is at a premium. A flat surface and reasonable lighting are preferable, although we can bring additional lighting with us if necessary, and we have been known to cope with playing on a slope from time to time. Please let us know in advance if you have any questions about the suitability of your chosen venue! For small venues, we require no amplification; for a large venue, you'll need to provide a sound system. An additional speaking mic is recommended for a duet concert. We can perform outdoors, but not in temperatures that are too hot or too cold, as extreme weather conditions can be detrimental to our performance and our bells. We'll need shelter from harsh sunlight, and will need to be indoors if there's rain or snow! We're available for bookings during the day as well as in the evenings, on weekdays and weekends. We're friendly, professional, polite and punctual, and will work with you to ensure that our performance will contribute to the success of your event. We're always happy to answer any questions you may have, and you're welcome to contact us via GigSalad messaging, email or phone if you'd like to know more before you request a quote or book us for a performance. Let us know how we can enhance your event with the music of handbells! Now located in West Michigan, we both started playing handbells in 1987, but more than 5,000 miles apart; Larry in California, and Carla in England. As a member of various UK-based handbell ensembles, Carla performed extensively throughout England, and also in Estonia, France, and the USA. Larry has been a member and director of several handbell choirs in the San Francisco Bay Area of California. He is a bass bell specialist, and the author of The Bass Ringer’s Notebook. We first met online on a website for handbell musicians – and, after a couple of years in a long-distance relationship, we were married in California in 2012 and started performing duets together, building up a wide repertoire of pieces arranged for just eight bells. In 2016 we moved to Holland, Michigan – and since then, we've performed in New York City, Georgia, Pennsylvania, New Jersey and (of course!) Michigan. We played Christmas carols at the Salvation Army Red Kettle during our first two Michigan winters, and were featured on Fox 17 News. 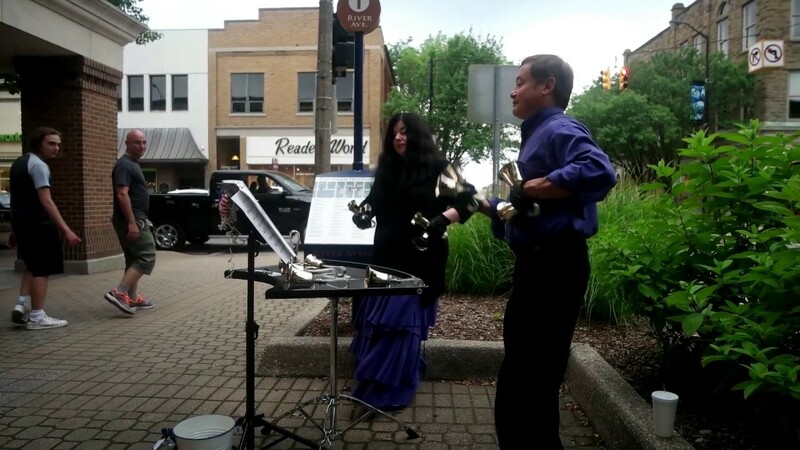 In the warmer months, we can regularly be found playing our handbells on 8th Street in Holland, and we enjoyed taking part in the 2017 and 2018 Downtown Holland Street Performers Series. In April 2018 we were the guest artists for the Handbell Musicians of America Area 5 conference on Mackinac Island. We have participated in the annual Bay View Week of Handbells in Petoskey, Michigan since 2009. 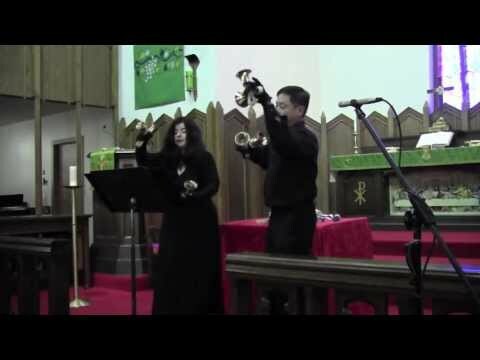 We arrange all our own handbell duets, and aim to demonstrate that handbell performances are not only beautiful to listen to, but can also be graceful and interesting to watch. We are available to play duets for concerts, wedding ceremonies, community and corporate events, parties, and Christmas and holiday events, in Michigan and beyond. We're experienced church musicians, so if you're looking for special music for a worship service or church event, please get in touch. We can play prelude and/or postlude music, offertory music, music during Communion, or for entertainment during coffee hour or special events. We can suggest hymns, or provide a list for you to choose from. Please note that we are not the usual kind of Christian band; we don't have guitars, vocals or drums - so if you're looking for upbeat, sing-along, clap-along music for your church event, then we might not be the right people. If you need an original and interesting program for a senior living community or community group, we can help. We have programs suitable for Christmas and holiday events, or for more general use during the year. For small groups, we can often also offer a "have a go" session using handchimes (an easy-to-play alternative to bells), so that members of the audience can learn to play a short piece without needing to read music. Handbell music can be a beautiful addition to a wedding ceremony, particularly in a smaller venue. Our music is more suitable for wedding ceremonies and cocktail hours than for receptions, where a larger sound from a bigger band might work better. We can play a prelude before the service, to welcome guests as they arrive and take their seats, and during or after the service as required. We can also play "peals" in the traditional style of English church bells. We can play for memorial, funeral and remembrance services, where the gentle music of handbells can be both beautiful and comforting at the most difficult of times. We have a wide repertoire of traditional Christmas music, and during the holiday season we can provide entertainment for corporate, church and community events - greeting guests as they arrive for a party, providing background music to create the perfect seasonal atmosphere, or playing at candlelight services and holiday parties. Early booking is recommended, but we can often consider last-minute bookings too. Lighting: We'll need adequate lighting to ensure that we can see our music, although we can bring additional lighting with us if necessary. Staging: Our space requirements are small. We can set up for eight-bell duets in a space of approximately eight feet wide by seven feet deep. The place we perform in should ideally be flat and level. Sound: For a small room, we require no amplification, but you'll need to provide a sound system for a performance in a larger space. For a program in a senior living residence or for a church or community group, a speaking microphone is useful, even if the room isn't large. Please let us know if you have any questions! Our eight-bell duet repertoire is growing week by week. Most of our current titles are in the public domain, because that avoids copyright and legal issues. If you'd like to request a particular piece for your event that you don't see in the list, please let us know, and we'll find out what's possible! Quelle est cette Odeur Agreable?